Tromso – a beautiful scenery and an interesting city in the far north. 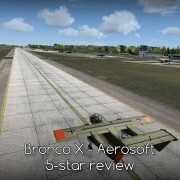 Norwegian add-on for FSX and P3D shows a great skill of its creator and comes at a very good price. It is an excellent craftsmanship with a bit of magic. 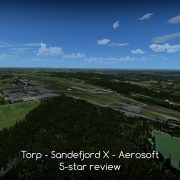 What I like in Aerosoft’s Tromso X? There are two main features that set Tromso apart from other sceneries – craftsmanship and magic. The excellent craftsmanship of its creator is the first. If you can think of some techniques that are currently used in scenery design – like placing volumetric grass, creating building interiors or animating cars on the apron – you will find it in this scenery. But that is not all. I think that the author of this scenery simply likes this place (or/and his job). There is a touch of local magic that Jo Erlend Sund brought to this scenery. It is the magic of the North, of the small city in Northern Norway. Being myself fascinated in this region – I loved to feel this magic when flying to Tromso. The story of Tromso is a story of a small town. Just imagine – the city charter was issued when there were only 80 people living there – which shows the significance of this place to local trade rather than the size of the eighteen century Tromso. It grew to about ten thousand inhabitants by the beginning of the twentieth century and like in most Norwegian cities – the aviation appeared in Tromso early – with seaplanes being the first to visit. Seaplanes were used during the unfortunate search for Italian explored general Nobile, whos airship crashed when attempting to reach the North Pole. Among the rescuers was Roald Amundsen – famous for his exploration of the Poles. Amundsen’s plane disappeared on the 18th June 1928 and was never found. Fortunately for Nobile – other search parties found the camp of the crew and resupplied it. Nobile’s crew was later rescued by a Soviet icebreaker and Nobile himself was evacuated by plane. During the forties and fifties, seaplanes become obsolete in the role of passenger and transport planes and the need for an airport arose. At this time Tromso was served by Ju 52 transport planes build in the thirties. The plane was considered obsolete during the second world war when it was used (mostly as a land transport plane) by Germans. It had no place in commercial aviation in the fifties. 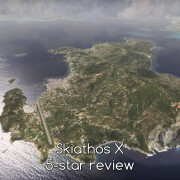 Several locations were considered for the airport. At first, Bardufoss was used when seaplanes could not operate, but the bus ride took at least three hours, which prompted local politicians to ask in Oslo for a proper airport. Negotiations lasted for some time with the airport lobby asking for more every time some concessions were made. At first, a 1600m runway was to be made. Then it was decided that the runway will be 2000m long. Finally, a 2160m runway was build (300m shorter than today) so that all planes used in Scandinavia could land in Tromso (it was important that the Caravelle of SAS airline will be able to operate from this airport). In 1964 the first flights commenced. Since then the airport was extended and its facilities grew to the current size. Tromso Airport (ENTC) is located in Langenes, on the western shore of Tromsøya (Tromso Island). 01/19 runway is 2447 m long (8,028ft) and 45m wide (150ft). Airport elevation is merely 32ft. The apron is located to the west from runway and there is a small taxiway leading to several hangars for GA aircraft on the opposite side of the airport. ILS (CAT I) is provided for both landing directions. If you arrive in a small plane – make sure to check the VFR routes (you need to access AIP). SAS, Norwegian, Widerøe and NextJet airlines fly from Tromso to several cities in Norway, Sweden and Finland (Oulu). Wideroe is a leading airline with many local flights. Those airlines use 737s, Dash 8s, BAe ATPs, and Saab 340s. In summer Lufthansa operates a scheduled route to Frankfurt. Also in summer several charter airlines fly to holiday destinations like Greece, Spain, Turkey and the Canary Islands. The biggest plane that ever landed in Tromso was an Airbus A340 of SAS – if flew Japanese tourists from Tokyo. 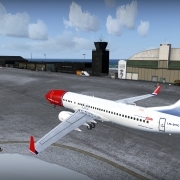 Tromso X was developed for Aerosoft by Jo Erlend Sund – who created such FSX add-on airports like Stavanger, Bergen, Svolvaer, and Trondheim-Vaernes. This list itself is a great recommendation. 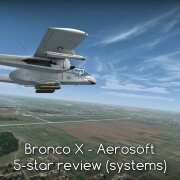 In terms of how it is published – Tromso X is a typical production by Aerosoft – with “Aerosoft” manual (in both English and German), Aerosoft installer (you need to enter your email and personalized product key to install it). Additionally Tromso X is delivered with a set of charts (unfortunately, it does not include VFR chart, but on the other hand – airport diagram is much better than the one in AIP). You can buy this scenery in Aerosoft’s store for 18,55 Euro (including 23% VAT tax – the tax in your location may be different – usually smaller). It is a download version. Box version is not available. If you are searching for Tromso in Aerosoft’s store – type in Tromsø, not Tromso – without the Norwegian ø, you will be unable to find it with the search engine. When the installation is complete I suggest you run the configurator first. Unfortunately – for me, it did not work properly. If you observe any problems – go to this thread where Jo-Erlend published a fix. 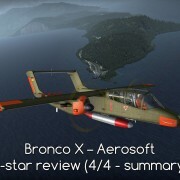 http://forum.aerosoft.com/index.php?/topic/105730-tromso-x-problem/#comment-736620. After the old files were overwritten – I had no problems configuring the scenery. For this review, I use all additional options like 3d passengers, dense grass (exception – no grass in winter), etc. I saw no reason (apart from the grass in winter) to turn anything off. The scenery performs great with all these features. You may notice that the config tool is named “Bergen” instead of “Tromso” – do not mind this. The scenery contains the airport and its closest vicinity – Tromsøya (Tromso Island). It makes 22 square kilometers of scenery (there is a typo in the product description – the area is 21 or 22km instead of 121). The island is covered with 50cm/px photoscenery. As you may know from my previous reviews – I consider 50 or 60cm/px as a very good choice for a photoscenery surrounding the airport. The airport itself is covered with 20cm/px photos (which is also a great choice). Thanks to these photo sceneries approaches and departures are much nicer as we see the real ground beneath us. The autogen is placed correctly and it works well with the photo-background. When flying over the city – make sure you look for the custom objects like Tromso University (several brown buildings) with a helipad nearby. If you visit the University – make a quick trip into the hills to find the Ski Jumping Hill (Norway is famous for its ski jumpers – even the king enjoyed this sport when he was young). The city scenery is made mostly of autogen (with only some specific buildings made using custom objects) so it performs nicely. The autogen density is excellent. I tested this scenery with my FTX Norway as the background so the surrounding mountains and towns are enhanced if compared to the default FSX. I strongly recommend FTX Norway as a base for this scenery. The North. Cold, Far North. It is an inaccessible and harsh land where you do not waste your time for unnecessary actions. This is reflected in the architecture – simple and efficient. It may be considered boring. But this is how they build airports in such locations (I had the same feelings when I reviewed Juneau Airport). The good thing is – the scenery shows just that. It is great in creating the emotions I usually feel when I am in Norway. On the other hand – it is beautiful in its efficiency and clean design patterns. So get a free camera or use ORBX Bob add-on to move around the place. Get into the terminal – you can start right from the jetway and then move through boarding area, waiting-halls to the bistro. Ir down to the check-in hall. I still can not believe that such a detailed building does not cause serious FPS drops or VAS problems. But it does not! It really works! I was surprised when I saw that the small yellow markings on the docking system change when I taxi in. The screen shows when to correct position to the right or left. And how far forward should I go? It is a great tool when taxiing in a 737. A little right, more to the right. Ok – closer, closer and then STOP. No need for any add-on marshallers or outside view when parking a plane. My favorite element of every scenery – small objects, clutter… all those airstairs, baggage carts, fences, etc. There are plenty in here. And the modeling is superb – the airstair has the handrail modeled. In some places there are some strange cranes with some piping or wiring attached – I still do not know if those are fuel or electrical connections – I need to check that. But I like how the details are designed – even a rope that is probably used to turn the think is there. I chose animated cars – and they are here. Moving around the apron. I wanted static planes – there are several. Dash 8 awaits its passengers. Another is parked by the Wideroe’s hangar. A bizjet is parked nearby. Yellow helicopter – somewhere else. I only miss general aviation planes – Tromso Flyklubb buildings are closed. Apart from the terminal – there are much smaller and bigger buildings at the airport and around it. You will find a Statoil gas station and a shopping mall on the opposite side of the airport. I like how the textures resolution fits the viewing distance. For example, show advertisements in the shopping mall use a smaller resolution (correct for viewing from airport) and the gas station uses higher resolution – as it is located just next to the airport. Thanks to such optimization the scenery performs so well. As in many large airports, the grass is placed mostly at the edges of taxiways and aprons (and it does not cover the whole area between the taxiways). I understand the logic behind this choice (better performance), but I would like to see more grass. On the other hand – I like the variety of plants. Just look at this bushes that I found behind general aviation hangars. This is one of those sceneries that set the standards that I would like to see followed by other scenery makers. It is good. I would like to see more airports for FSX created with this precision, quality and character. Great! Perfect! I love this scenery for its performance. 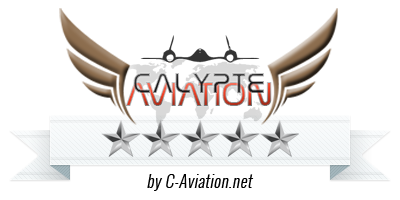 I used it extensively with the 737 (PMDG), often in bad weather and I find it a better performer than most add-on sceneries I use. There are two main features that set Tromso apart from other sceneries. The excellent craftsmanship of its creator is the first. 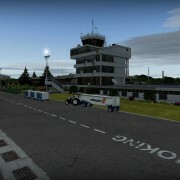 If you can think of some techniques that are currently used in scenery design – like placing volumetric grass, creating building interiors or animating cars on the apron – you will find it in this scenery. But that is not all. I think that the author of this scenery simply likes this place (or/and his job). There is a touch of local magic that Jo Erlend Sund brought to this scenery. It is the magic of the North, of the small city in Northern Norway. Being myself fascinated in this region – I loved to feel this magic when flying to Tromso. It is a very good scenery for a very good price. It is a deal!